Top Munro Vol 2: Whisky Hills are 100x62mm plastic coated trumps cards featuring 30 Munro mountains selected for their proximity to distilleries. There are 282 Munros in total (Scottish hills over 3000 feet), and this pack is for 2 or 3 players to play easily. The cards arrive wrapped in cellophane in a laminated tuck box for added protection. Full instructions are included. 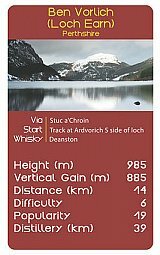 Each card features a photograph of a Munro and six key facts about that hill, a potential route to climb it and a distillery within bagging distance of the hill.